This is a Craps Championship winning strategy. 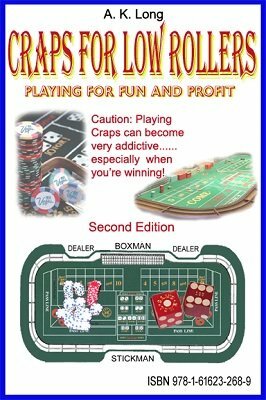 This is an ebook about "how to win" at playing craps. It covers all of the basics of the game so you will have a working knowledge of the table layout and various bets. Many of the craps wagers that you see players make are sucker bets and don’t apply to this winning strategy. Yes, the house can be beaten on a regular basis! Twenty five chapters of do's and dont's with full color examples including an explanation of why this winning strategy works. You will pay for this ebook with the first roll of the dice! If you are a beginner or new to the game it will give you all of the knowledge you need to start your play and avoid starting bad habits. If you are an experienced player you will learn how to avoid some of your bad losing habits and start winning. 1st edition 2009, 84 pages.